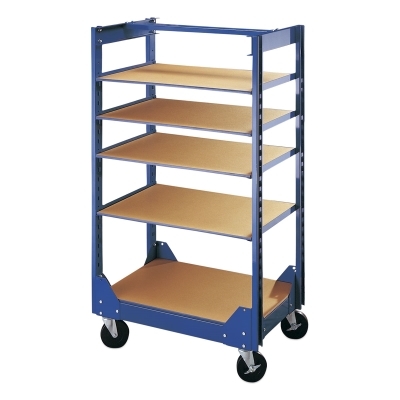 North Star makes this most versatile ware truck for the classroom or studio. It features all steel construction and big 6" (15 cm) industrial wheels for easy rolling. Two of the wheels have parking brakes. The North Star Shelf Truck can carry ceramic ware, kiln furniture, clay, etc. All shelves are instantly adjustable on 2" (5 cm) centers. It holds as many as 23 shelves. Use full shelves, half shelves, and even oversized shelves of birch, plywood, particleboard, etc. Comes complete with four pairs of shelf brackets (yield five shelf levels). It ships knocked down in two cartons. Two-year guarantee.